POS User Only – The POS module will get launched automatically and the user cannot open other modules. Default Warehouse – The user’s default warehouse. Default Division – The user’s default division. Restrict Location to – Sets user to one location and not allow them to switch. 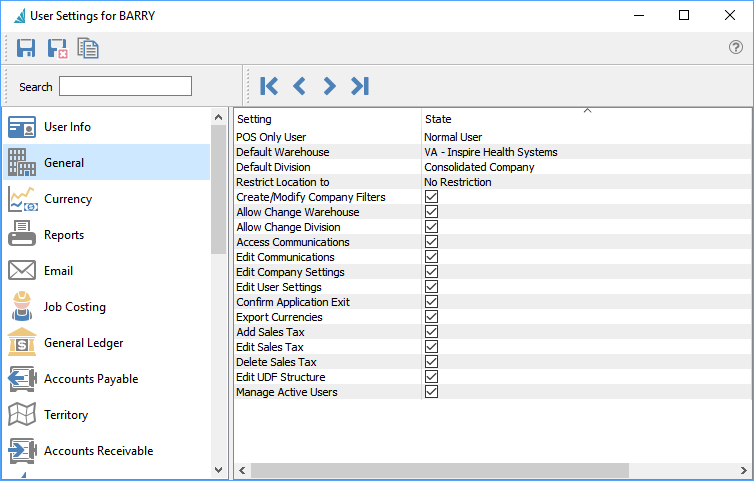 Create/Modify Company Filters – User can create company-wide filters instead of just their own. Allows Change Warehouse – User can switch to another warehouse. Allow Change Division – User can switch divisions. Access Communications – Allows user to have access to the Communication module. Edit Communications – Allows user to edit communications. Edit Company Settings – Allow user to edit company settings. Edit User Settings – Allows user to edit user settings. Confirm Application Exit – When exiting program asks the user is they are sure they want to exit. Export Currencies – Allows export of currencies. Add Sales Tax – Allows the user to add new sales taxes. Edit Sales Tax – Allows editing of sales taxes. Delete Sales Tax – Allows deleting of sales taxes. Edit UDF Structure – Allows creation and editing of User Defined Fields. Manage Active Users – Can set the active flag on a user.